Keeping track of all the dangerous beauty ingredients in skincare, makeup and more can be a daunting task. How are we supposed to memorize a long list of words when we can’t even spell half of them? Take a picture — it’ll last longer. If you’re reading this then chances are you already understand the importance of clean beauty. At the very least, you get that slathering our skin with toxic chemicals daily is about as health-inhibiting as a mono-diet of chicken nuggets. To each their own, but we think our bodies deserve better. These are abbreviations for diethanolamine, triethanolamine and monoethanolamine, all of which are ethanolamines — ammonia-based compounds used as emulsifiers and foaming agents in cosmetics, shampoos, soaps, body washes, shaving creams, fragrances and sunscreen. The International Agency for Research on Cancer warns that DEA can react with nitrites in other products to form a carcinogenic combination; as a result, the European Commission restricts its use. TEA and MEA are also believed to pose the same danger. These are umbrella terms for the sometimes hundreds of constituents that make up a particular fragrance, none of which are required by law to be listed. MADE SAFE, a nonprofit organization that tests and certifies nontoxic products, notes, “Companies are legally allowed to keep individual fragrance ingredients secret because they’re deemed ‘confidential business information,’ or what’s also known as a ‘trade secret.’” Many of the ingredients used to maintain the scent and color of perfume, lip balm and nail polish include phthalates, which have been banned in the EU and in children’s toys in California (phthalates are also used to plasticize products). Phthalates have been linked to reproductive disorders in both males and females, endocrine disruption, allergies and breast cancer. A study conducted by Columbia University’s Mailman School of Public Health showed that children subject to high levels of phthalates in utero were 70 percent more likely to develop asthma between the ages of 5 and 12. Another common ingredient found in fragrance is styrene, which MADE SAFE reports has also been linked to endocrine disruption. Used to lighten and even skin tone, hydroquinone is banned in the UK, Australia and Japan and has been shown to enhance carcinogenic risk by damaging DNA. Studies have shown it to be a skin allergen and respiratory toxin. In addition, it can decrease skin elasticity and cause thinning of the skin. A by-product of the distillation of petroleum to produce gasoline, mineral oil is used in baby oil, moisturizers and styling gels. The World Health Organization considers mineral oil a carcinogen, the EWG reports that it can be contaminated with cancer-causing hydrocarbons during the refining process and research published in the Journal of Investigative Dermatology reveals that the oil causes tumors in mice exposed to UVB. Although mineral oil never spoils and does a good job of trapping moisture, it creates a film that clogs pores, thus hindering the skin’s ability to slough away debris and excrete toxins. That’s why it makes our short list of dangerous beauty ingredients to avoid. Parabens are preservatives used since the 1920s to prevent growth of bacteria and mold in facial cleansers, body washes, lotions, antiperspirant and foundation. A study published in Toxicology and Applied Pharmacology showed that the chemicals have been linked to endocrine disruption; parabens compete with estrogen for sites to attach throughout the body, thereby potentially affecting hormonal balance. According to the Journal of Applied Toxicology, research also suggests parabens may enable development of cancer in human breast tissue. Triclosan is a broad-spectrum antimicrobial agent found in cosmetics, toothpaste and deodorants. According to the Mayo Clinic, triclosan alters hormone regulation in research animals (and likely in humans as well) and may be harmful to the immune system. The American Medical Association advises against the use of triclosan, citing studies that show its widespread use in cleansers and hand sanitizers has contributed to the development of antibiotic-resistant germs (not to mention the inclusion of triclosan appears to offer to no additional benefit in preventing illness, as compared to plain soap and water.) As noted above, it also can combine with the chlorine in tap water to create carcinogenic chloroform. The International Journal of Environmental Research and Public Health reported that the chemical poses a threat to water supplies and is having an adverse impact on fish and other wildlife. the FDA’s regulation of beauty ingredients here. 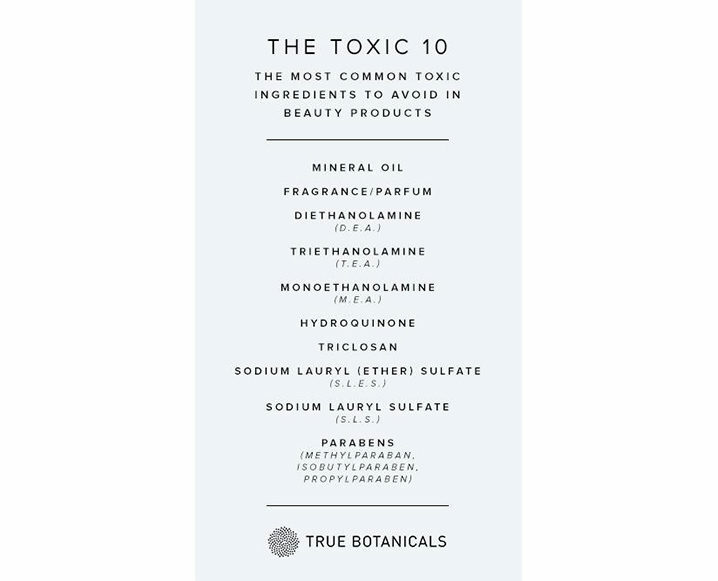 Share the post "The Toxic 10: Dangerous Beauty Ingredients To Toss Right Now"
Ridiculous! This is CLEARLY paid advertising for “True Botanicals” corporation. There isn’t a beauty product or shampoo made without these things in the last 150 years. Just because these things are made using these ingredients doesn’t mean they are good for you, Greg. They are included to make a product more attractive and last longer to benefit the businesses that are producing them. There are also lots of options for hair and skincare that don’t contain them, it just requires a little research!